Today article is about an installation of GNOME Commander on latest Ubuntu 17.10. Moreover, this is my very first article in English and after very long time even, when I wrote my last article here in Czech. 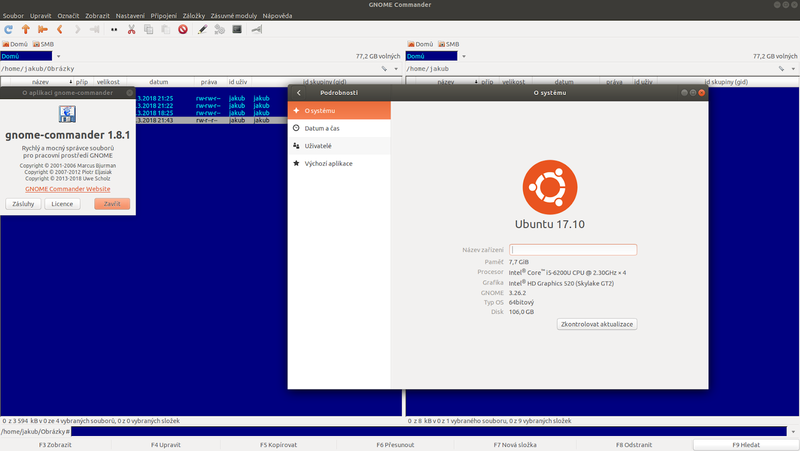 I have installed Ubuntu 17.10 recently after about 2 years when I was not able to use any Linux distribution because of hardware incompatibility (graphics card, wired headphones...). But now, with Ubuntu 17.10 are these problems solved and nothing block me to use Ubuntu again finally. I am quite addicted to file managers, namely Total Commander on Windows. I was used to using GNOME Commander on Ubuntu last time and I was curious, what new is with GNOME Commander, so I decided to try it again. Unfortunately, in Ubuntu repositories is an only pretty old version of GNOME Commander (1.4.8, 2016) and since I have not found any repository with this software, I was forced to used good old way - installation from application sources. And this article is about how to do it. 2) You are familiar with working on Unix console and your user has admin (sudo) privileges.